Tuesday was the seven-year anniversary of Hunter S. Thompson blowing his brains out. I was going to write about it then, but I've been in bed with the flu since the weekend. I'm still in bed, but I'm now sitting up, and drinking a Chivas Regal on the rocks. I first met Hunter in the summer of 2003. At the time I was working ten to twelve hours a day at a fireworks tent in MD just off exit 100 on I-95. The tent was pitched next to a liquor store, and right across the street from a gas station. Among the stack of books I'd brought along to get me through the day was the Modern Library edition of Fear and Loathing in Las Vegas. I couldn't have asked for a better time or place to be introduced to Gonzo journalism: sitting at one point of a triangle of disaster, beer under the register, Dylan on the speakers, and the 227th anniversary of our nation's birth just around the corner. We were smack-dab in the middle of the Bush nightmare, and I was spending my summer vacation selling dangerous explosives to rednecks. It was the perfect moment to hop in a fire-apple red convertible with a renegade journalist and a fat Samoan lawyer for a drug-addled road trip to Vegas in search of the American Dream. 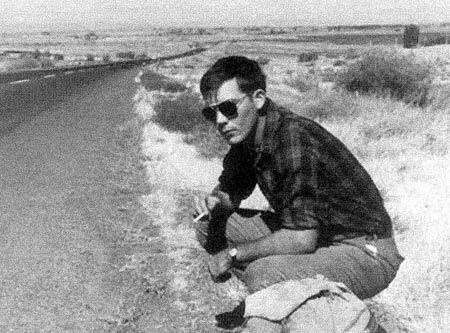 After the Vegas book, his other two mandatory works are Hell's Angels and Fear and Loathing: On the Campaign Trail '72. Campaign Trail shows Thompson at the absolute apex of his ability--one of the most insightful and hilarious books about a presidential election ever written. It's impossible to read it without feeling the soul-crushing defeat of George McGovern's ultimate loss. It's equally difficult to walk away from it without knowing exactly why Nixon won. McGovern himself is on record as saying, "That is the most accurate and least factual book written about that campaign." Unfortunately, Campaign Trail left a high-water mark that he never saw again. This isn't to say that nothing he wrote after that was any good (on the day after 9/11, he wrote a frighteningly prophetic article predicting the highlights of W's "War on Terror" for the next seven years.) It's just that none of his subsequent work had quite the level of depth that marked his writing from the mid-60's to early 70's. From that point on he had increasing difficulty getting a firm grip on the changing entity of American politics, and even when he did, he couldn't hold on for long. One of the reasons for this decline in quality was his failure to break away from his image. Just as myths are kept alive by being retold in every generation, artists have to be born again (or at least learn some new tricks) to avoid going stale. 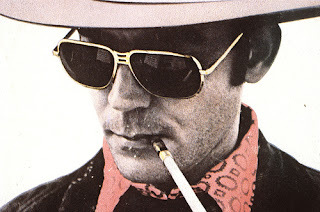 Several times throughout his career he expressed a desire to kill off the old Hunter and reinvent himself. Unfortunately he kept slipping back into the screaming, tripping caricature that his audience wanted. Also, let's be honest, the drugs did a number on his brain. In the early 70's, the acid was present in his work, but his work was enhanced by it rather than hindered. He could drink, smoke, snort, pop, shoot, and eat any substance known to man, and still write about sports and politics in a lively, coherent fashion. But by the end of the 80's, his life of excess had taken its toll, and he couldn't stay on topic for more than two sentences. It's a shame that people only passingly familiar with the Doctor know him only as a guy who did loads of narcotics and screamed about giant bats. While that was certainly part of his technique, it was far from the defining factor. He was a man with an unquenchable thirst for knowledge, and a knack for absorbing all the culture of his environment, then letting it explode on the page like a petrol bomb. He was a patriot who cared deeply about the state of America, who dedicated his life to railing against injustice and fighting for everything he believed to be good in the national character. For all his missteps, he was a valuable asset, and his suicide is our loss.